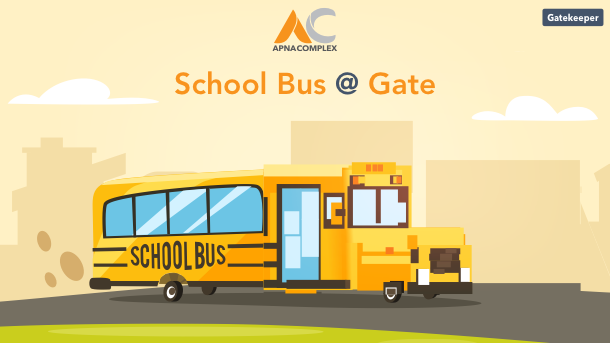 We are excited to announce “School Bus @ Gate” – an innovative capability on ApnaComplex to enhance Convenience, Safety and Security at your Apartment Complex / Gated Community. The life of the parents of a school-going child typically revolves around school bus timings. Parents always want to be aware of when their child’s school bus arrived for pick up in the mornings and dropped the child at Apartment Gate. With “School Bus @ Gate” functionality, we assist parents of school-going children residing in the Apartment Complex with instant notifications when the school bus comes to the gate! This offers unparalleled convenience to the parents as they would know if the bus has arrived before the child has reached the gate and when the child was dropped at the gate. On the ApnaComplex App, under the My Unit tab, you can associate yourselves with the School Bus by which your child is commuting. If your child’s school bus or the route is not listed – just go ahead and add a new school bus on the App. You can also add multiple buses for each school if needed. Parents of other kids going via the same school bus can associate themselves with the school bus. Whenever the bus comes to the gate to pick up or drop, all the residents associated with that bus would get a push notification on their mobiles. Super convenient! Residents can not only check the history of bus timings for any bus – but also quickly get to know other residents – who have children going on the same bus route. All School bus routes that were created will automatically show up on Gatekeeper app that the security at your gate uses. Security Guard at the Apartment Main Gate records the movement of the school bus on the Gatekeeper which then gets synced with the ApnaComplex cloud platform, which in turn sends notifications. Yet again, ApnaComplex raises the bar with innovative features that really matter!